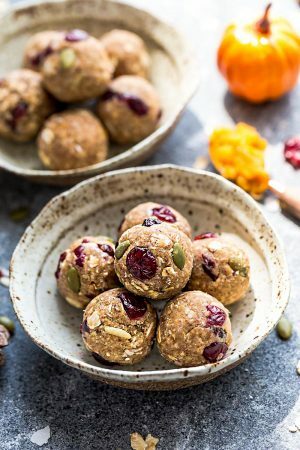 Pumpkin Chocolate Chip Muffins – the perfect easy ONE BOWL breakfast or on the go snack for fall. Best of all, they’re soft, tender and bursting with cozy and warm fall flavors. Plus recipe video. Once the weather starts to cool off, it’s officially pumpkin “season” in our house. My family absolutely loves every thing pumpkin flavored and are always on board whenever they find out pumpkin is on the menu. 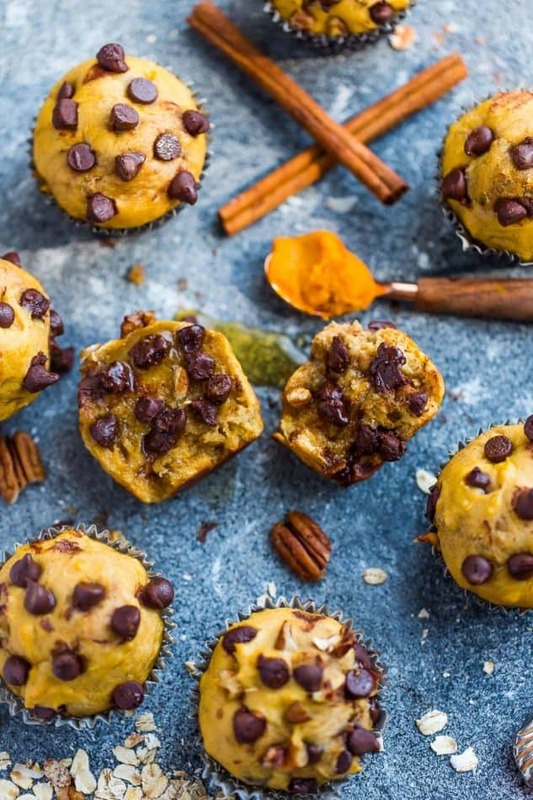 For this reason, I actually stock up on pumpkin so that we can have pumpkin treats, like these Pumpkin Chocolate Chip Muffins all year long. This easy recipe comes together in under 30 minutes. And the best part? Just ONE bowl, a whisk and a spoon. That’s right…no mixer is required. 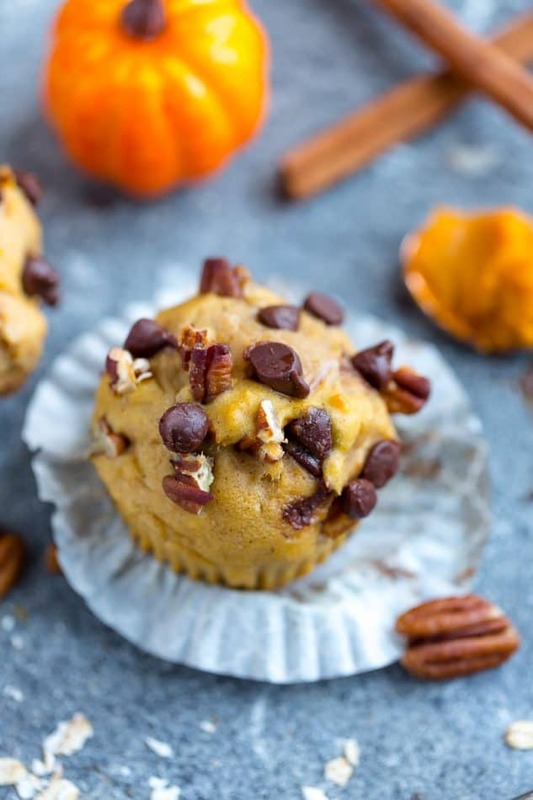 It’s perfect for breakfast, an after school snack or anytime you need a quick pumpkin treat. 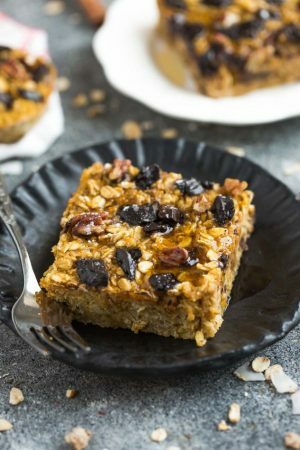 Plus, it’s loaded with easy to find pantry ingredients and bakes up moist, fluffy, with a subtle pumpkin taste. If you prefer a stronger pumpkin taste, feel free to increase the amount of pumpkin pie spice.I find the flavor and texture is even better on the next day. 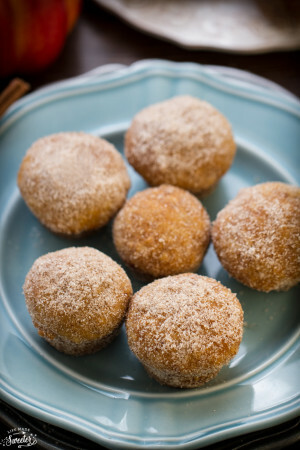 Or freeze them up and heat one up for breakfast for a delightful fall treat. Grease a 12 cup muffin pan with non-stick cooking spray or line with liners. In a large mixing bowl, mash banana using a fork. Whisk in pumpkin, eggs, coconut oil, honey, vanilla, milk and yogurt. Add brown sugar, baking powder, baking soda, pumpkin pie spice and vanilla extract and whisk until combined. Slowly add flour and stir with a wooden spoon until just combined (do not overmix - it's okay if you still see a little bit of flour) and gently fold in 1/2 cup of chocolate chips, reserving the rest for topping. Scoop batter (I use a cookie scoop) evenly into prepared muffin pan, filling about 3/4 full. Top with extra chocolate chips or pecans if desired. Bake at 415 F degrees for 5 minutes, then reduce the oven temperature (leaving the muffins inside oven) to 350 F degrees, and bake for an additional 6-9 minutes (do NOT overbake as muffins will continue to cook after removing from oven) or until toothpick inserted in the middle comes out clean. Remove pan from oven and allow the muffins to cool in pan for 10 minutes.